Why is it that Glen Eira is so out of kilter with every other council, especially when it comes to providing information to residents on vital issues, or even providing decent, informative answers to public questions. Kingston Council met with Victorian Transport Minister Jacinta Allan last week to raise community concerns about the Level Crossing Removals project. Minister Allan, Mordialloc MP Tim Richardson and LXRA representatives visited Council’s Cheltenham offices to hear directly from the Mayor and councillors and discuss upcoming community consultation on the project. “The meeting was incredibly productive and we were able to pass on community concerns and advocate for a well-planned strategic approach that makes the most of this once-in-a-generation infrastructure project to deliver great long-lasting results for our community,” Mayor Tamsin Bearsley said. “The Minister confirmed in principle that the next stage of community consultation, due to take around the middle of this year, would include detailed information on different options available at each individual site including environmental impacts, engineering analysis, acoustic reports and estimated costs so our community can make an informed decision and have their opinion clearly heard and taken into account,” Cr Bearsley said. The Minister’s visit followed recent calls from Kingston Council for improved community consultation by the Level Crossing Removal Authority before any decisions are made about level crossing removals in the area. “We presented a short video from the Chelsea and Bonbeach Train Station Group to show positive approaches and ideas being generated by our community that are alternatives to a skyrail,” Cr Bearsley said. Mayor Tamsin Bearsley said councillors had received strong community feedback opposing a skyrail option for the Frankston line and criticism of recent public consultation sessions held by the Level Crossing Removal Authority (LXRA). The Victorian Government’s list of 50 level crossings for removal includes seven in the City of Kingston – Centre Road Clayton on the Dandenong line and six level crossings on the Frankston line. PS: it is also worth pointing out that the 100 or so public questions which were taken on notice from the previous council meeting are not included in the minutes – as required by the Local Law!!!!! PS: here’s a photo we received in conjuction with a comment. It shows a trailer parked (in a No Standing Zone) as part of the LXRA operations and presumably without a permit. Yet, council in its responses to public questions claimed that only 5 permits had been granted for ground works. The trailer has been there for well over a week! Thus, how much faith, credibility, can residents place in any response they receive from council? there is also several questions by the councillors about Caulfield Racecourse. Lipshutz claims that the landscape plans are on the trust website. Has anyone found them? The liberal Councillors made an an issue of sky Rail and public consultation. Did they make an issue that public consultation should have been conducted towards the dissasterous residential zones? Bunch of hypos. Kingston working in conjunction with local resident groups who were permitted their video presentation. This would never happen in Glen Eira. Doesn’t fit in with their “keep community out” philosophy. Councillors do not write the answers to public questions. They are the work of Burke. Councillors often don’t even see the answers before they are read out. That comes straight from the horses mouth so to speak. Magee wouldn’t have written an answer in his entire 8 years on council so he can stop bullshitting and claiming that he spends hours looking for evidence. He wouldn’t know evidence if it sprang up and hit him in the face. Typically lousy responses from Council. There is very little evidence that Council has lobbied on our behalf. There are no public records of any conversations between Council, Council staff and LXRA. Council hasn’t published its correspondence. The one thing it did is publish a submission arguing for consultation. That has since been undermined as Council has pointed out as recently as Tuesday it doesn’t believe in consultation unless tightly constrained to what the dominant faction wants. Council claimed on Tuesday the only permits it had issued for the Skyrail project were 5 Asset Consent permits. 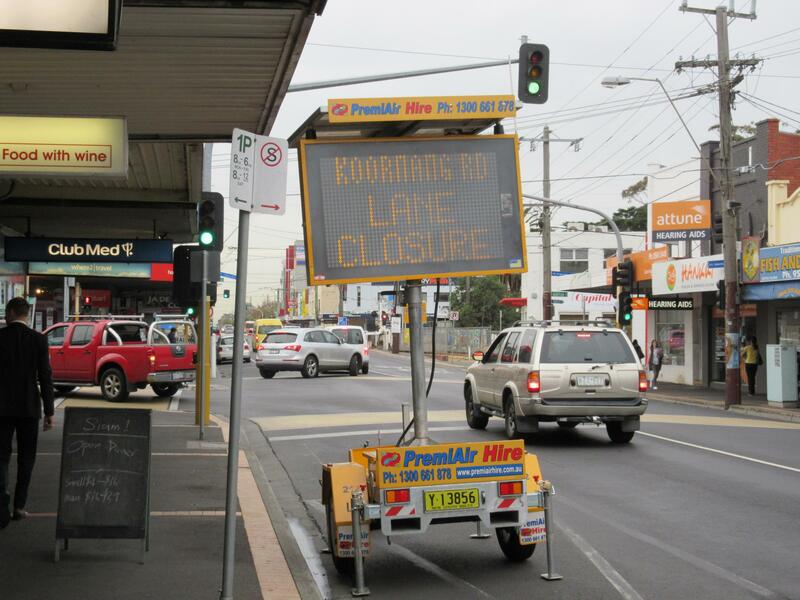 Signs have been erected for a week advertising lane closures on Grange and Koornang Rds around the level crossings, which ordinarily would require Road Closure permits. So does LXRA have the necessary permits? Council staff claim LXRA doesn’t need them because it is a “major project” and “it’s the State Government”. It is arguable that the project doesn’t have planning permission. There is a Cranbourne Pakenham Rail Corridor Project Incorporated Document but it contains conditions that preclude Skyrail, as it was written for a trench solution. Where is the Traffic Management Plan? Where is the design response that addresses all issues raised during any community consultation? Council should be all over this, rather than bullshitting.